Ryan Ratajski of Fuzzrocious pedals has a reputation for high quality, hand-wired sonic mayhem, and NAMM 2019 heralded the arrival of his latest stompbox design – an original take on the octave-pedal theme. There is a palpable sense of relief when our research reveals that the word “jawn” is Philadelphian slang for “an object, person, place or thing,” a fact which enables us to adroitly sidestep double entendres and objectively evaluate this massive knob. 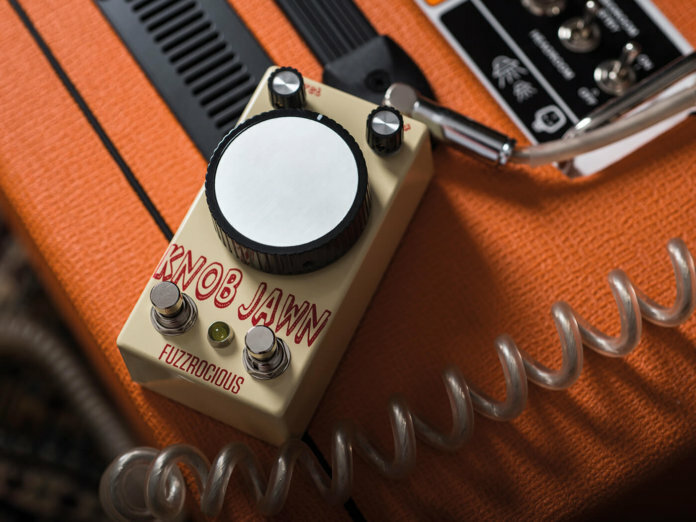 Like all Fuzzrocious pedals we have seen, the Knob Jawn runs exclusively from a direct power supply (nine-volt DC 2.1mm centre-negative adaptor) for ecological reasons, and feels sturdy and well made. The layout of the pedal is clear and well labelled with dry:wet and -/+ knobs in the top left- and right-hand corners respectively. There are two footswitches, a standard on/off toggle and a Momentary switch on the left-hand side, more of which later. 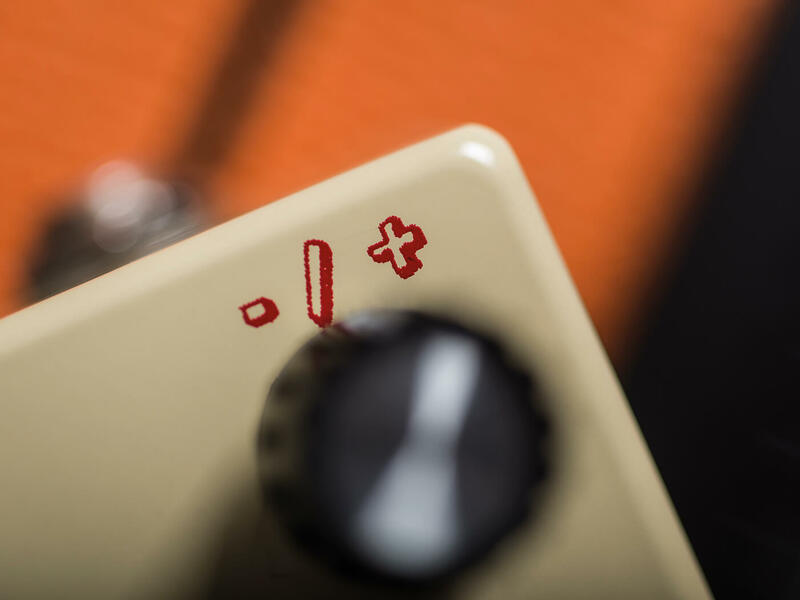 The main knob from which the pedal takes its name is a blend control which allows the user to move seamlessly from a full analogue to a full digital signal, and all points in between. Dressing to the left, we unleash myriad wonderful, glitchy textures not unlike those to be found when playing chords through an original Whammy pedal. Vintage Nintendo-style beeps and squeals are there in abundance with the Knob Jawn set to an octave up, and as we blend in a lower octave we discover a rich seam of deep, crunchy lunacy which can be rescued from complete incoherence (should you wish) by adding more dry signal with the dry:wet knob. Going full analogue also adds an invigorating shot of distortion to the mix. 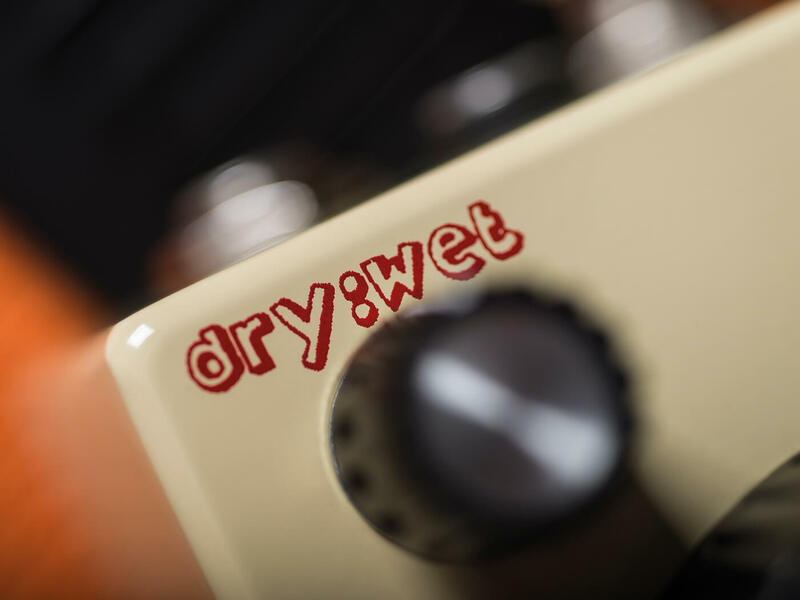 It’s in the combination of the dry:wet control and the main analogue/digital knob that we find the most potential. Even subtle tweaks are capable of engendering new and intriguing textures. Our top three are immediately christened “Alien Flatulence”, “Polyamorous Rhino Cult” and “Boiling Denim”. These are, of course, onomatopoeic. Finally, the left-hand footswitch unlocks the diametric opposite of the setting currently engaged, immediately opening up further possibilities for ear-bending riffage à la St. Vincent, Jack White and other pioneering timbrenauts. Not one for the Dumble-hungry blues hound, the Fuzzrocious Knob Jawn will unapologetically ruin your tone in very creative and beautiful ways, especially in combination with other effects such as delay and fuzz. If you want to make music you have never heard before then this intuitive and refreshing approach to the octave harmoniser could play a starring role. An ingenious and creative octave pedal for the quality-minded sonic hooligan.